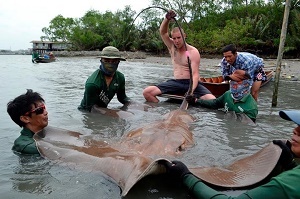 Tim Webb from Palm Tree Lagoon and a friend returned to the Maeklong River in Thailand fishing for Giant freshwater stingrays. After travelling downstream the anglers were soon positioned on a wide section of the Maeklong River with baits fishing at various points. After a short period of time one of the floats burst into life as a Giant freshwater stingray moved off with the bait. On winding down into the stingray the heavy duty stand up fishing rod was pulled into an alarming curve. Along protracted battle followed which saw the stingray clamping onto the bottom for long periods of time. On finally succumbing to the constant pressure applied from above the Giant freshwater stingray was slowly brought over the net. The Giant freshwater stingray was measured at a width of 174cm at its widest part and was estimated to weigh around 170kg’s+. After allowing the stingray a period for recovery it was then released back into the tidal river. With water conditions looking perfect the anglers were soon back in position with baits fishing at various points across the river. Another take soon followed which saw the anglers once again engaged in another epic battle. After a long protracted battle the Giant freshwater stingray was finally brought up from the depths. The big Giant Freshwater stingray was measured at a width of 195cm and was a particularly large specimen which was clearly well in the excess of 225kg’s, possibly even larger! The stingray was proudly displayed by the captors before being released back into the Maeklong River. With still further fishing time left the angler continued fishing for stingrays for the next two hours adding two smaller specimens to their haul of monster stingrays.